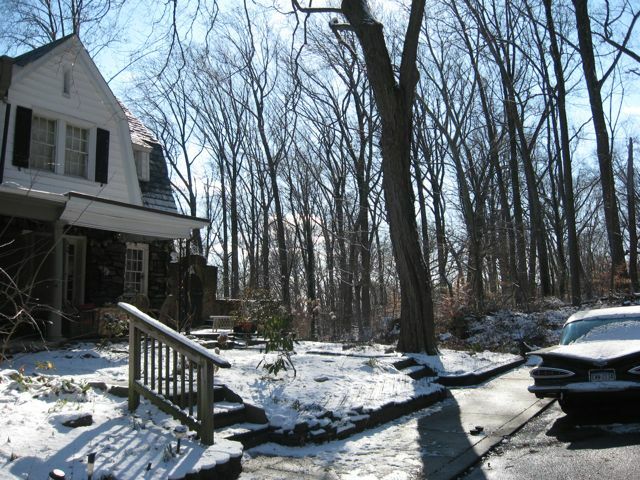 IN A NORTHEASTERN AMERICAN PIEDMONT DECIDUOUS UPLAND, URBAN FOREST REMNANT, A JAPANESE GARDEN WAS PLANTED IN THE 1920S AS PART OF A WEST PHILADELPHIA ROWHOUSE DEVELOPMENT. 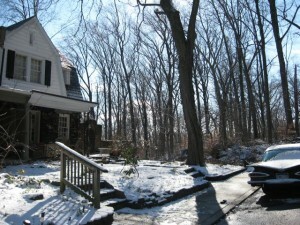 Here is the site we have been working on all winter. 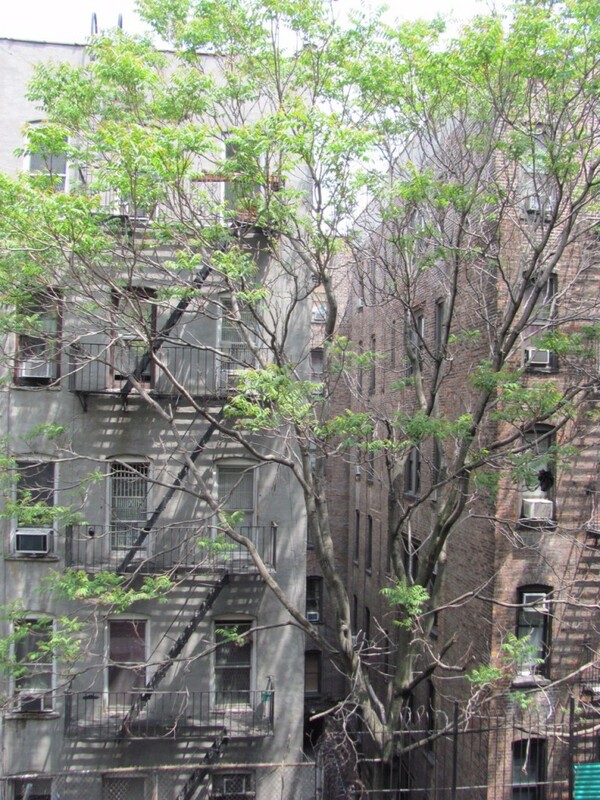 It is a degraded urban forest with a large hole in the canopy. 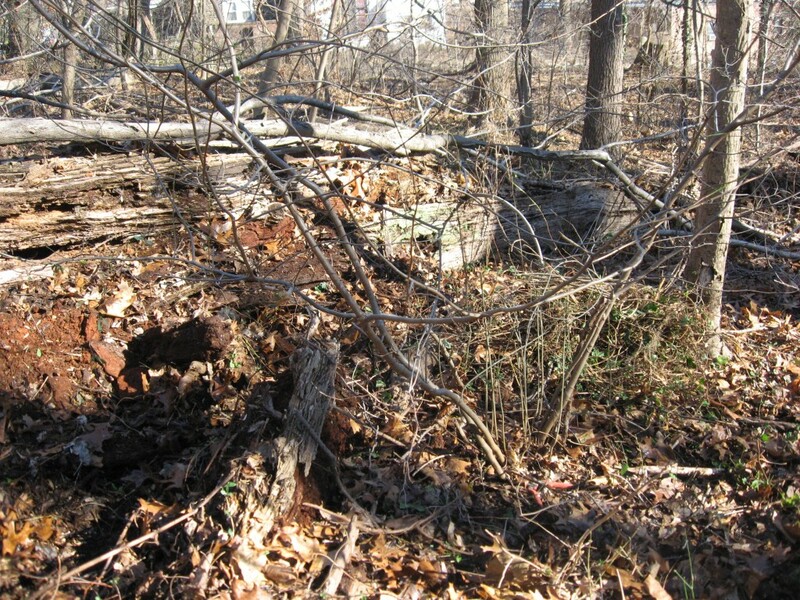 There is a large Oak log on the ground nearby, indicating this site was shaded by a grand oak tree for a long time, but with few younger native trees around it. When the Oak tree died, there were plenty of opportunities for invasive shrubs, trees and vines to gain prominence, furthering the deterioration of this site. Some of these invasives have actually been planted at the edge of the Park in the 1920s. We found a real estate advertisement for the adjacent rowhouse development in the Philadelphia inquirer, April 1925, describing a “Japanese Garden” being planted at both ends of the property. Being that the development bordered Morris Park, this Japanese Garden was most likely planted in the Park. Also the ad in the Sunday paper described an “english country cottage-style setting”, with “ivy-covered walls here and there”. That must explain the abundance of English Ivy found all along the edges of the Park next to the nearly 90 year old development. 1920s row house development. The last house on the right is Isabelles house. It is interesting to note that the houses were built with a theme that invokes a genuine aesthetic ideal. An imagery, constructed in stone, intended to mimick the look of an old ruined castle in the english country-side, one that has been abandoned and left to be covered with vines. The decayed castle on the low hill is surrounded by a rustic village, built by generations of farmers, perhaps descended from the original serfs of the medieval landholding. The cottages of this village have been crudely constructed with many stones that were salvaged from the original construction of the castle and its many walls. These charming cottages are uniquely crafted, some with planters built into the fronts, where flowers bloom in the spring. They are tightly abutting each other, as rowhouses are, and they are old and well worn, many covered in Ivy. Rarely evoked in architecture since the 1920s, is this romanticism which was embraced by the Arts and Crafts movement, which accentuated hand-made work especially that of a particular vernacular, embodied with a sense-of-place and the passage of time, expressed with local materials and traditions. The Ivy covered walls, “here and there”, evokes the romanticism that found beauty in ruins. Unique houses they are, built together and packaged with a bundle of sentiments designed to attract buyers who romanticize the past and the picturesque settings associated with it. It is interesting how the settings of a Japanese garden and the English cottages are brought together in this real-estate venture. The 1876 Centennial of America took place just 50 years before only three miles away, where a Japanese garden was created (and still exists and flourishes) stirring the imaginations of gardeners across America. Morris Park, which borders the development was an obvious place to build the Japanese garden, which included a small pond, now dried up. It is this legacy of the neglected, abandoned and forgotten Japanese garden that we are dealing with in the context of an invasion of exotic species, grown out of control, looking awful, and tearing down the forest of native trees and shrubs. There is much to be admired in the creation of a sense of place in the built environment, to sell a product to the imaginations of an anticipated customer; there is the sentimental landscape of history that is re-created with so much interpretation that it becomes historically noteworthy by itself, This development could be a significant historical example in Philadelphia of housing and landscaping developed together to depict the English countryside and a Japanese garden on the same plot. A city neighborhood is built with the charm and picturesque qualities of an old farming village in mind. Morris Park Road, just two blocks of homes, was completed in 1928. It is not known exactly what plants were appointed to the Japanese garden, or how long the garden remained tended. A long-time resident recalls the small pond on the site from the 1970s. 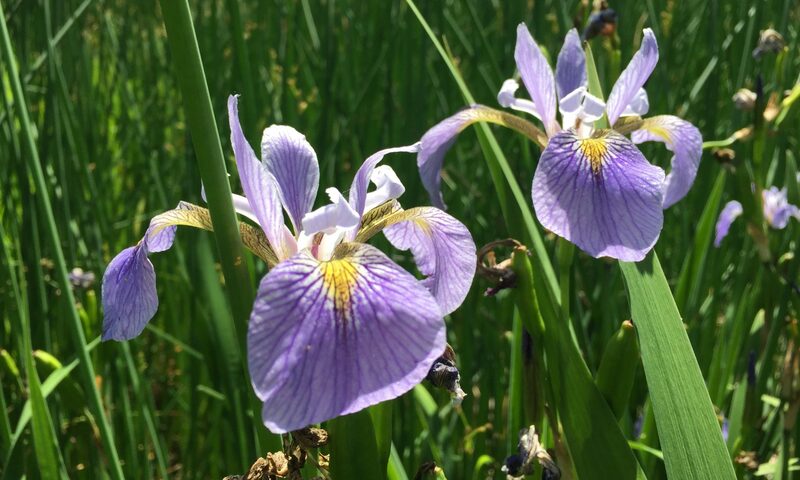 The plants that have remained are most likely the plants of Japanese origin that have spread beyond the original site of the garden, and are the ones that have become a problem. These would include: Japanese Pachysandra (Pachysandra terminalis), Japanese Honeysuckle (Lonicera Japonica), and Japanese privet (Ligustrum japonicum). While we have no definitive proof of these plants being in the garden, they are very suspect. 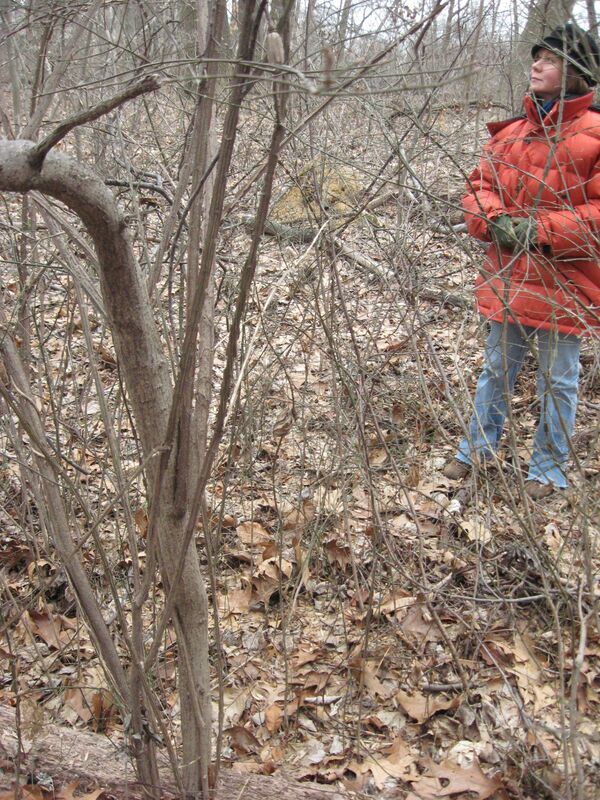 Also suspect are the many Asian viburnums present on the site and spreading into the woods. The English Ivy (Hedera helix) that climbs many a tree, along with the wintercreeper vine, the invasive Bishops weed and Vinca (Vinca minor) Vine are all elements found in the landscaping of the housing development, and very likely have been planted in the Japanese garden as well, given their proximity to the original location of the Japanese garden. The history of the housing development and the Japanese garden is very interesting, and it is fun to guess which plants may have been planted. 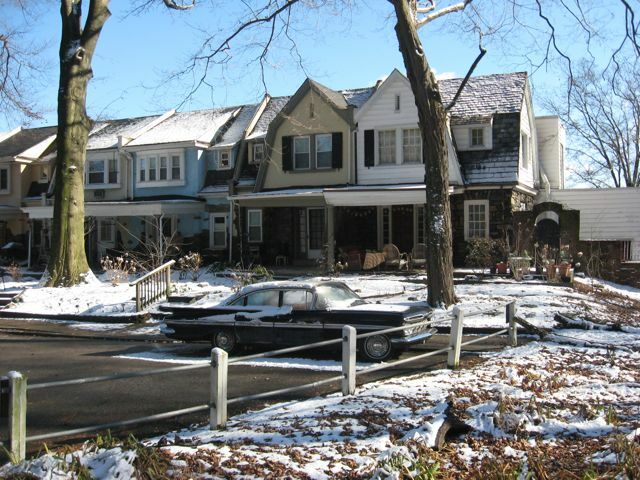 The vision created by the developers is appealing, and fascinating from the viewpoint of cultural history and the relationship to real-estate history, especially in the city of Philadelphia. One day these houses could be recognized for their historical significance in this regard. The house and gardens of The Sanguine Root, directly border Morris Park. The gardening and planting legacy left behind has become a problematic issue, being that this housing development was situated next to a fairly intact forest. 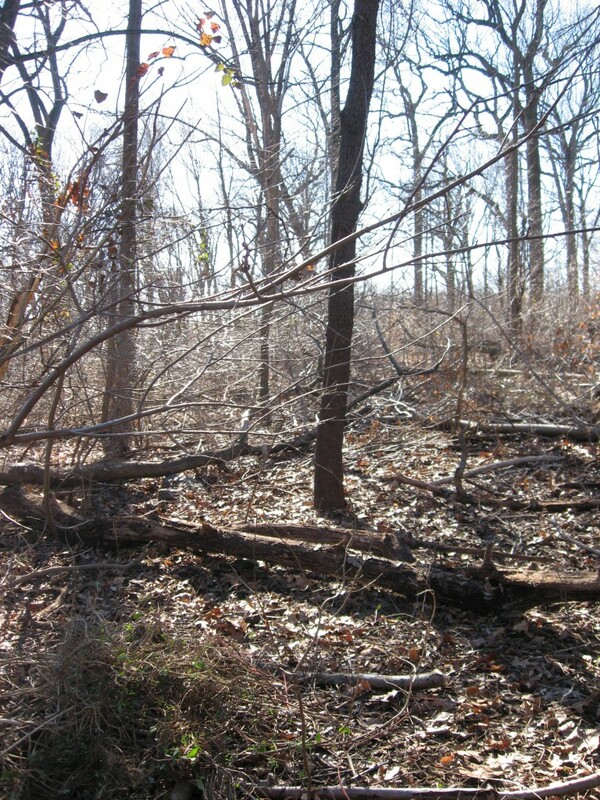 We know that the forest is best off as itself, and not a compromised and unsettled mass of foreign plants continuously threatening more and more of this original upland deciduous habitat, obviously under stress, due to the lack of younger trees along its borders, and several holes in the forest canopy. Isabelle wraps up Japanese Honeysuckle just pulled at our work site, an area infested with this invasive vine, just a few feet from the site of the 1920s Japanese garden. 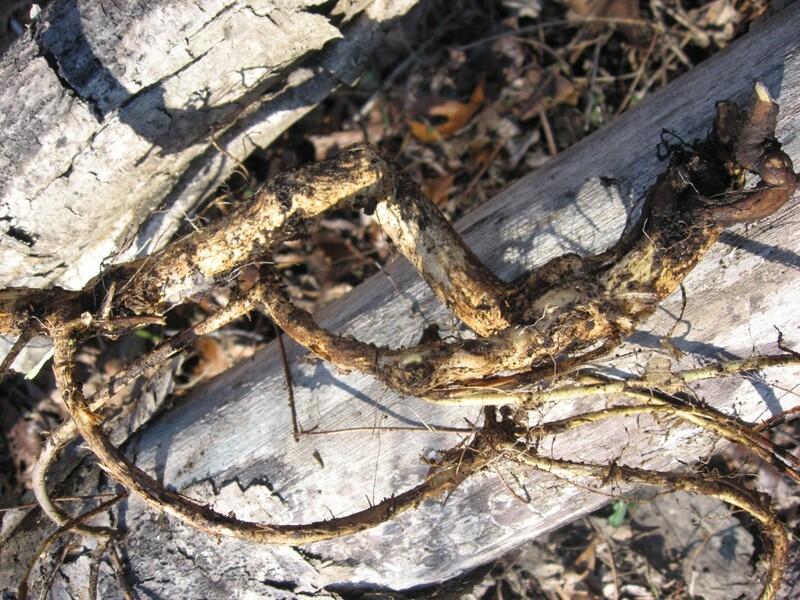 Pictured above and below is a large root of the Japanese Honeysuckle vine. Below is the site we are working on, removing mostly Asian invasive plants once and still planted as ornamentals. After this large Oak tree fell, there was a hole in the canopy with no small trees to fill it in, most likely because the invasives choked out any seedlings that tried to grow. Once the hole was established, the invasives became the dominant life-form, destroying the forest and the habitat it created. Our goal has been to reverse the degradation of this specific area of the forest, first by removing the invasives, and to return to the site consistently and continue to remove the invasive seedlings, allowing the existing native seedbank a chance to regain a root-hold. We began this project on just one section of this hole in the canopy, 5 years ago in the fall of 2007, and now there is a mini forest of native trees, shrubs and herbaceous plants that have sprouted on their own and have risen to over ten feet in height with our help keeping out the invasives. We are now initiating the same process on the other half of this canopy hole, now that we know that the process works and that we can keep up on the maintenence. All the while as we work on this project over the years, we must remind ourselves of the history behind the invasive introductions that threaten the forest. It is interesting to us how plants have been used by humans to create an atmosphere of nostalgia for the past at the same time creating a garden palette and ground cover that requires little maintenance, all the while selling something. English Ivy , Japanese Pachysandra and Vinca Vine were perfect for covering the barren grounds of a new housing development in the 1920s, but the long-term effects on the environment are problematic and reversing these spreading species in the nearby natural area is a difficult and labor-intensive task we are no where near completing. When it comes to plants, our society as a whole is reckless and insensitive to the needs of other species, perhaps blinded by a romanticism and love of plants combined with a controlling sensibility over the plant world. On the flip side to this problem, we as humans can do alot of great restoration to natural areas and our own yards by manipulating the plant world in simple ways such as removing the exotic introductions as much as you can or little by little, and re-introducing the native species. 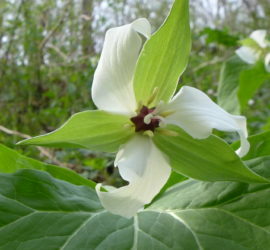 Often times, the native plants will reintroduce themselves! 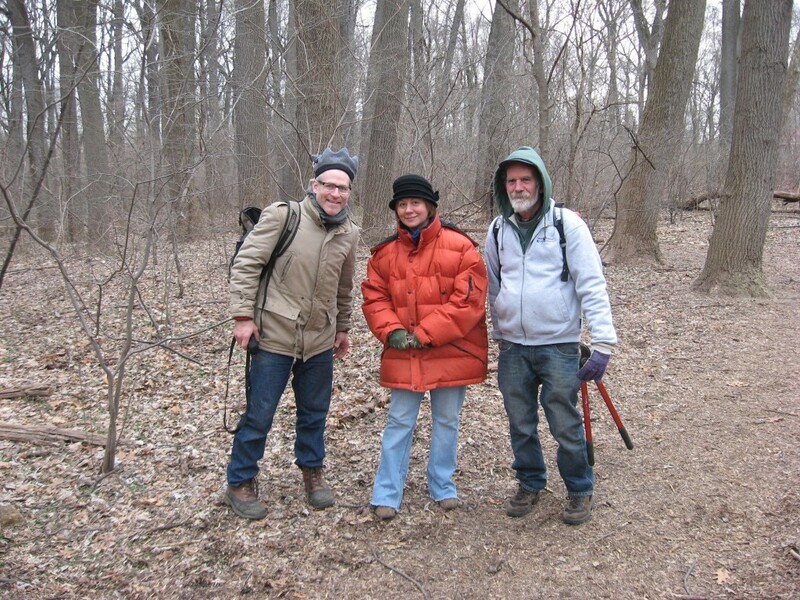 What has become a tradition, every February, on the week of Presidents Day, The Philadelphia Parks and Rec staff and the volunteers of the Sanguine Root collaborate on a very focused task of eradicating the invasive Japanese Angelica tree from Morris Park. 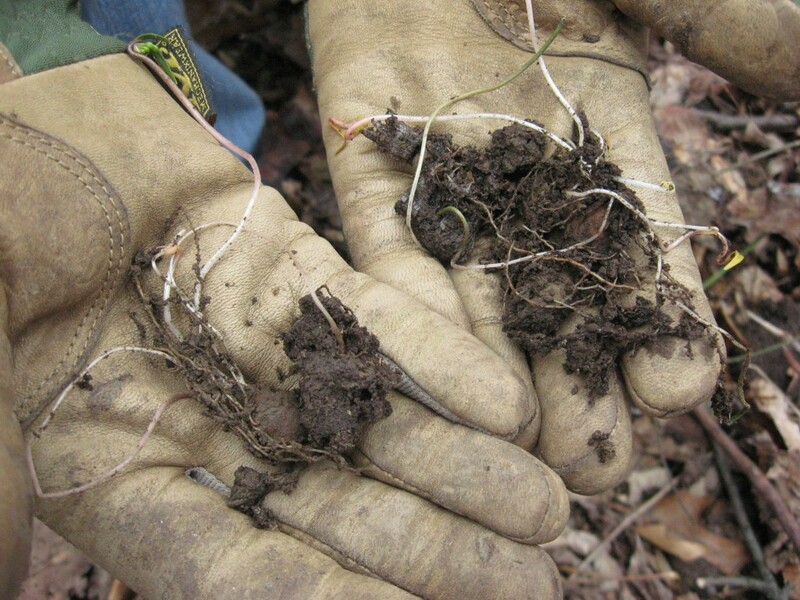 All year long, us volunteers pluck the tiny seedlings and saplings from the soil, numbering in the thousands. It is an ongoing effort to deplete the seedbank which has been replenished year after year by flowering and fruiting mature specimens that create complex and intensive root systems. These mature specimens require herbicide as a control, even as we remove as much as we can by hand -pulling, there is still that bigger problem. This species is aggressively appropriating habitat all across Philadelphia at an alarming rate. 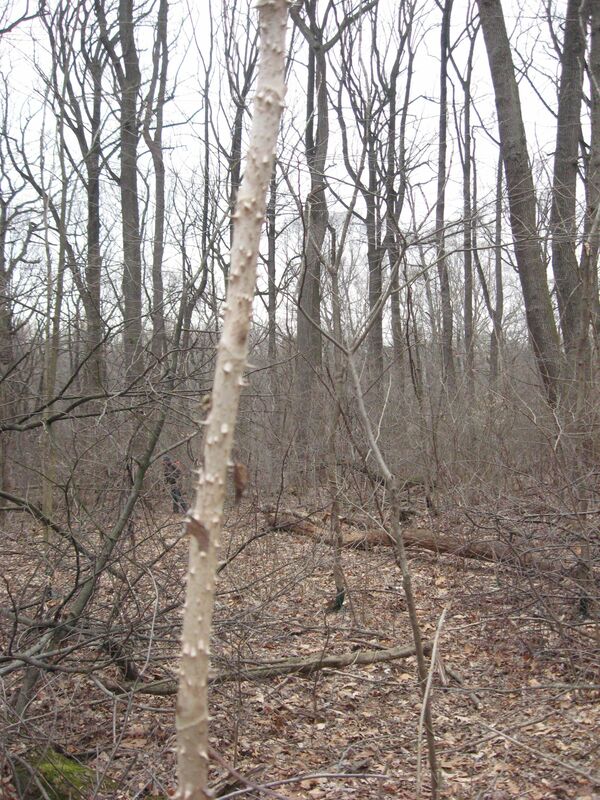 If an area of forest experiences canopy failure from the results of other invasives, the Angelica tree is one of the first on the scene. In forests where oak trees would normally drop their acorns and grow new trees, and a wide variety of shrubs would grow, now grows this monoculture of invasive trees, shading out all of the indigenous forest understory shrubs and herbaceous plants, and most disturbingly, the young trees, the saplings and seedlings are missing entirely under the darkness of this invasive Asian tree. 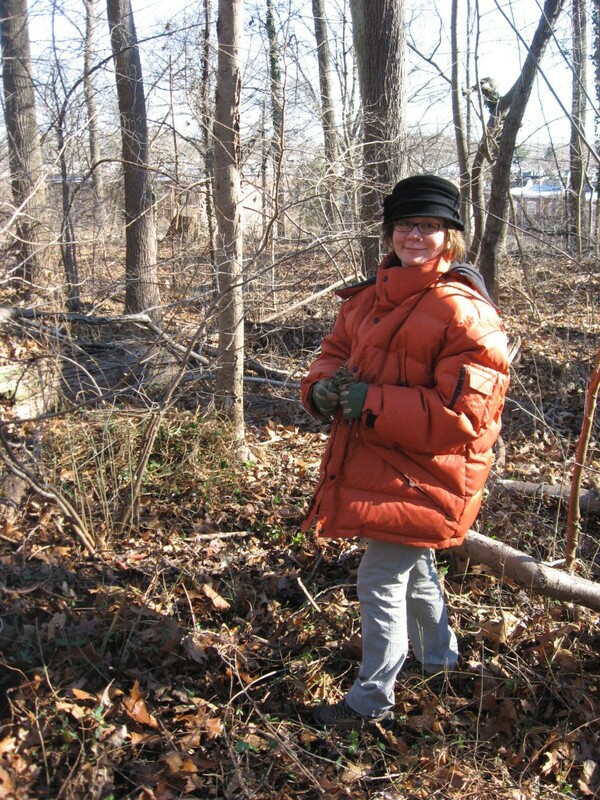 The future of the forests of Fairmount Park are being threatened by this species. 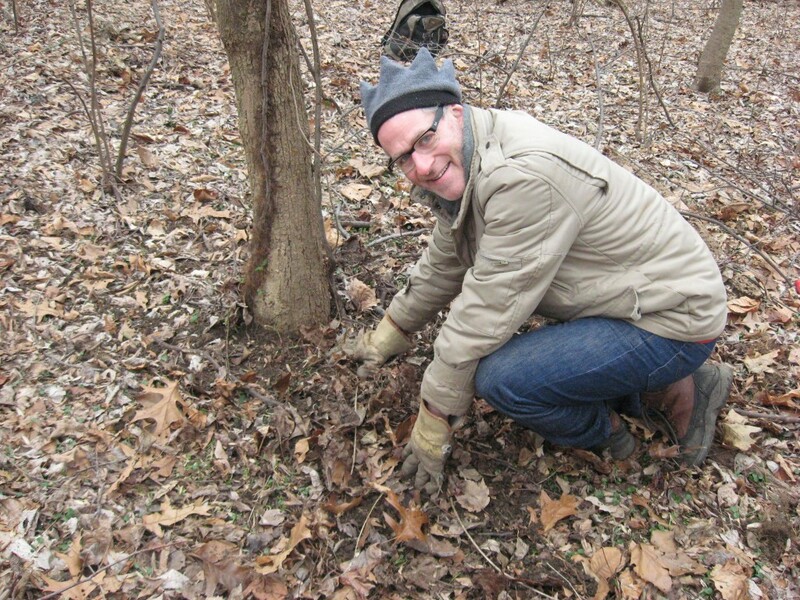 It has become an effort to save the urban forest, because every effort to help young trees germinate and grow is worthwhile, and this is an obvious one considering the proliferation of this noxious species throughout the Parks of Philadelphia. 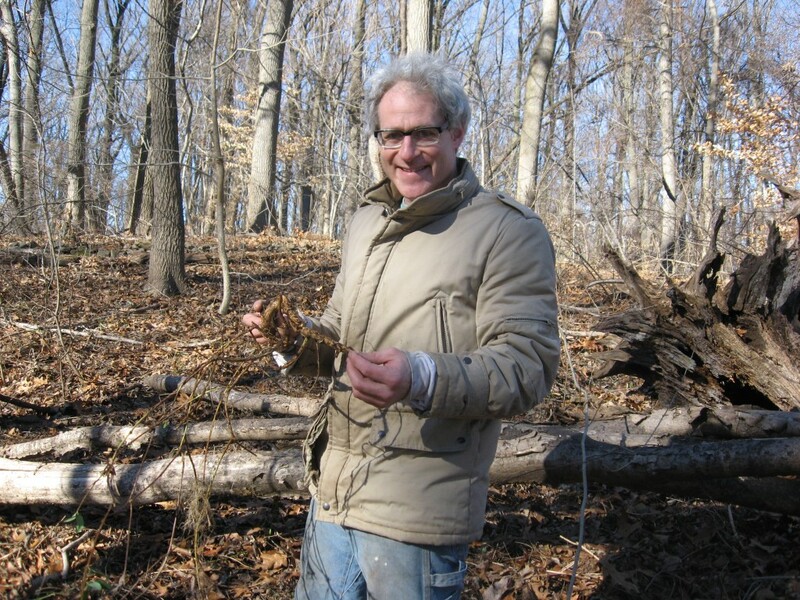 Several years ago, we were tasked by the City of Philadelphia Parks and Rec to map out the populations of the Japanese Angelica tree (Aralia elata) so we could then use the map to determine a course of action for their eradication. Using the map we created, we were then able to create a strategic plan of eradication sites, which we have been doing since 2011. We have a pretty good knowledge of all the populations in Morris Park, and we acted as guides for our staff partners at Parks and Rec, who are equipped with Garlon 4 ultra herbicide, loaded in tanks they carry on their backs. 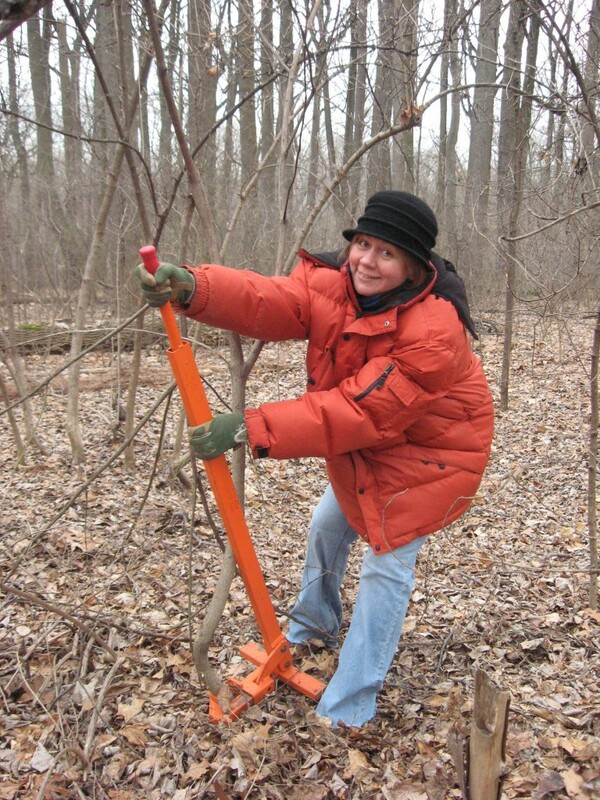 We showed them the infestations of mature, flowering specimens and stayed out of the way , removing another invasive, the Burning bush (euonymous alatus) with a Parks and Rec supplied weed wrench as they sprayed the Japanese Angelica trees with a basal bark herbicide application. 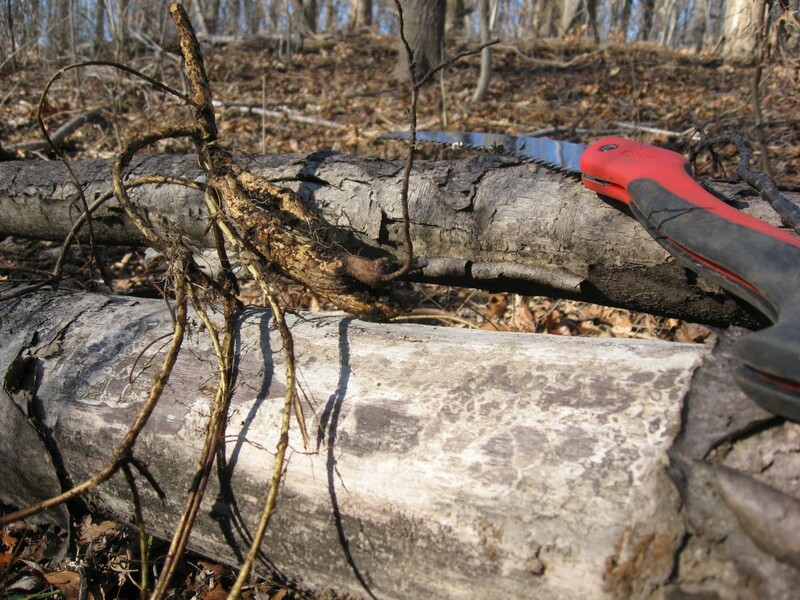 Our Burning Bush removal operation proceeds as follows: we pull out the bush and leave it on site, roots out of the ground where it will die in a few weeks and decompose back into the earth within five years. 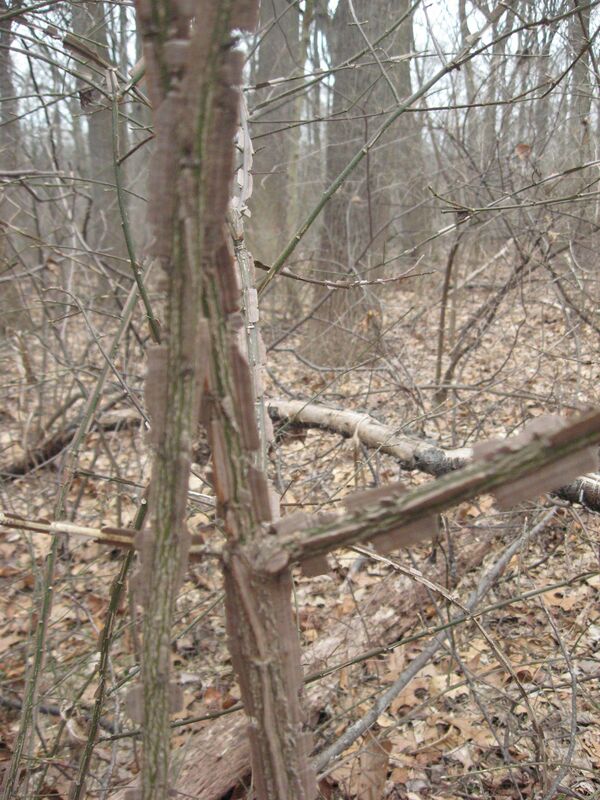 The disturbance from pulling the bush out of the soil becomes the next issue of concern. We sometimes find other plants attached to the extricated shrub, such as Mayapple and on this day we found the Spring Beauty (Claytonia virginica) an ephemeral Spring flower that grows out of a corm. 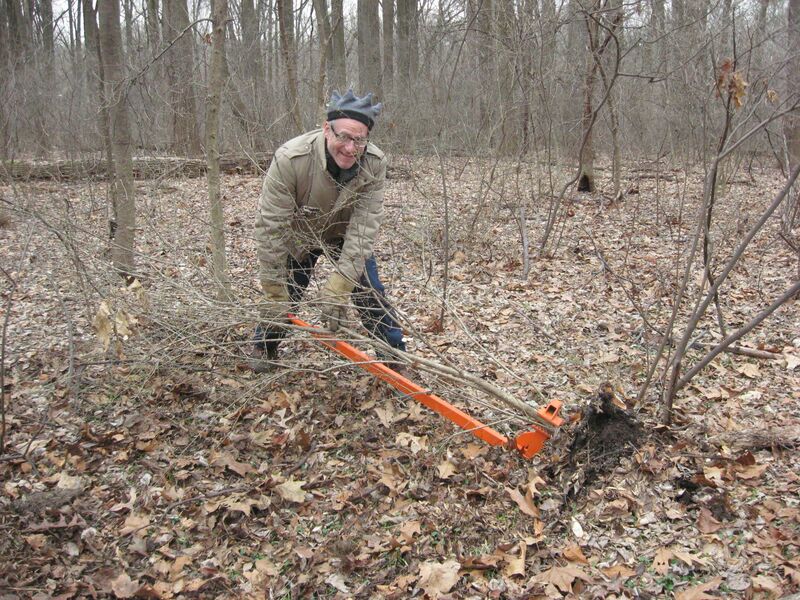 Pictured above, Sanguine Root volunteer Sean Solomon has just replanted roots of Spring Beauty and Mayapple that were uprooted along with the invasive shrub, Burning Bush. The soil is put back and the leaf cover is replaced as if there was never a problem. Hopefully our efforts at removing these invasive shrubs will result in the germination and sprouting of native canopy trees. We have had success with this phenomenon occurring in several other sites in Morris Park where we have removed invasives. Above is an infestation of the invasive Burning Bush. Underneath the large stems were hundreds of seedlings that we pulled out by hand. The largest stem was then cut and Parks and Rec environmental technician Luke Rhodes carefully applied herbicide on the cut stump. Above, the stems and corky wings of the Burning Bush. Above, these are the specimens of the native spring wildflower Claytonia virginica, the Spring Beauty, we found in the uprooted Burning bush. 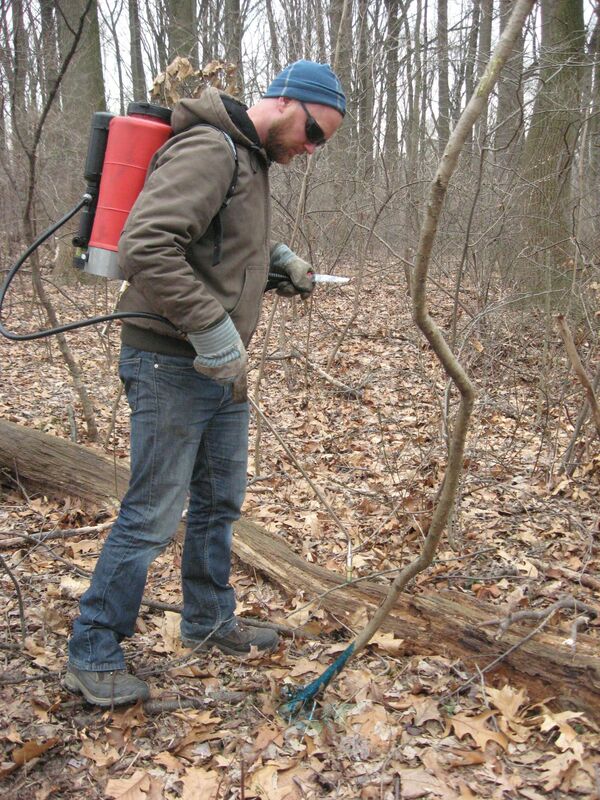 Luke applies a basal bark application of herbicide to the Japanese Angelica tree. A Black-Haw Viburnum shrub was discovered in our work area. 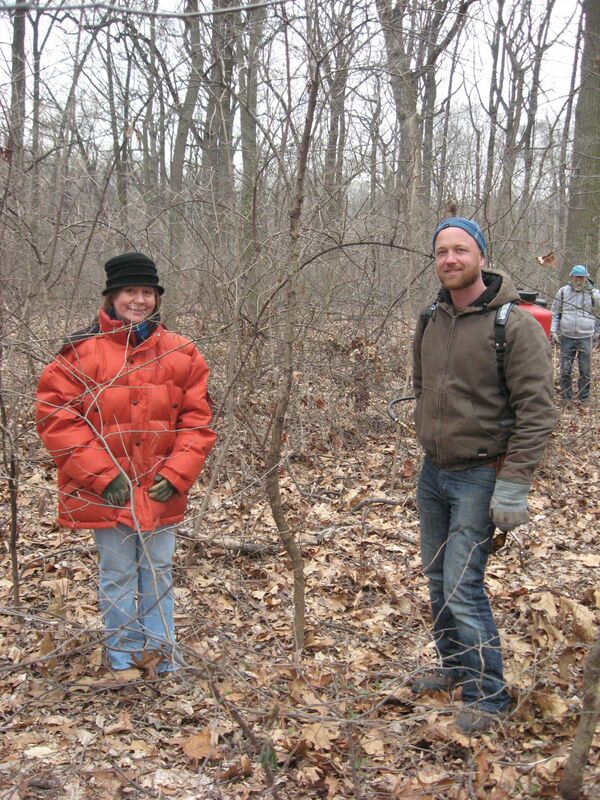 Finding this native shrub was an exciting moment in our day. 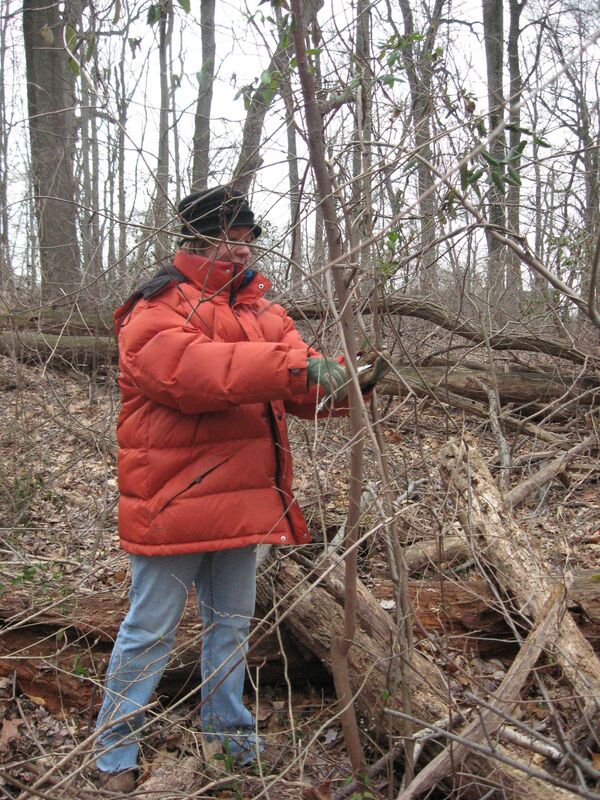 Sanguine Root Volunteer Isabelle Dijols cuts the noxious invasive Japanese Honeysuckle off of the young trees. Above, the invasive Japanese Angelica Tree, in the foreground. 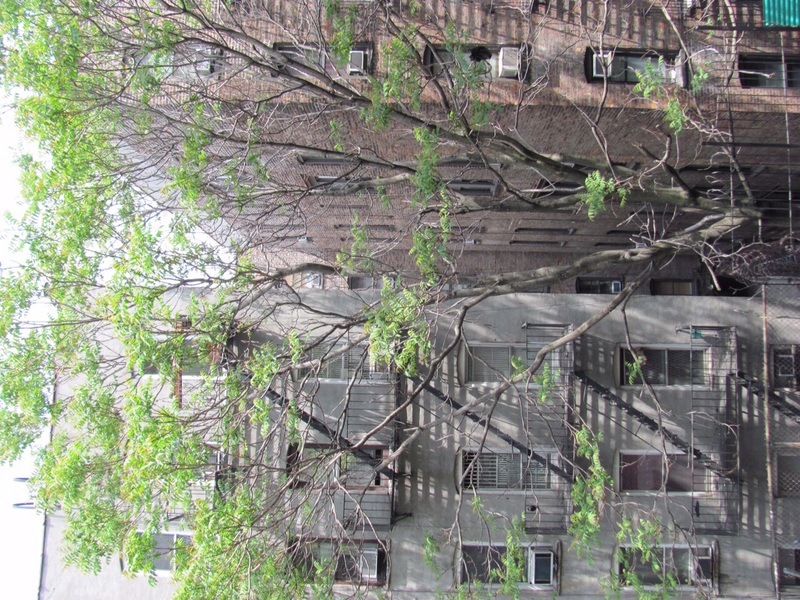 For a great introductory essay on this subject with references, please see our post The Japanese Angelica Tree Rapidly Invades Morris Park. Click here For photos of blooming flowers and a photographic guide describing the botanical differences between the North American native Devils Walking Stick (Aralia spinosa) and the Japanese Angelica tree. Luke, Rhodes, Isabelle Dijols, and Tom Dougherty, and below with Sean Solomon, Isabelle and Tom. 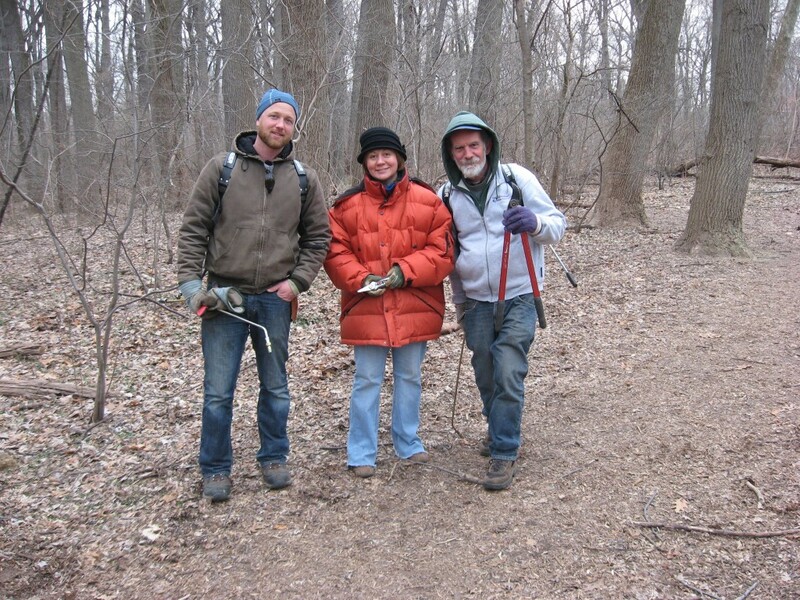 Going out and removing invasives is a great way to get exercise and be outdoors all the while accomplishing something of great environmental value and community service!